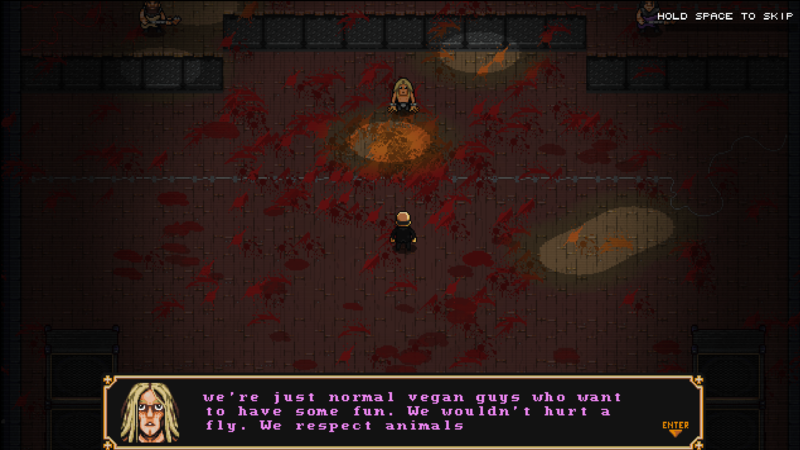 As its name implies, The Textorcist: The Story of Ray Bibbia is a game about typing and exorcising demons. Make no mistake though, this is not a collection of elementary typing exercises or a simple Typing of the Dead clone. It’s a bullet hell shooter that involves dodging enemy fire with the arrow keys while trying to type various biblical passages and Latin exorcisms at the same time. I took a look at this interesting mixture of ideas about one month back when only the beta version was available. Now that the game has seen a full release, can I say that it lived up to my initial impressions? 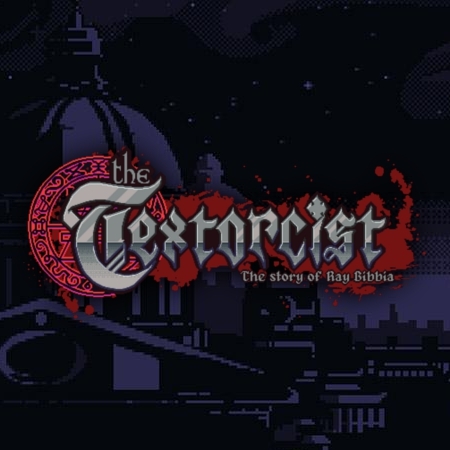 The narrative of The Textorcist is centered around Ray Bibbia, a disgruntled former exorcist now working freelance in Italy. Having left the Vatican due to “creative differences,” Ray gets involved with the Holy Church once again after learning about some strange demonic incidents that seemingly relate back to it. Along the way, he discovers that these occurrences extend way higher within the church than he initially suspected. Things end up getting personal and Ray makes it his mission to uncover the truth and put a stop to the unholy deeds of the Holy Church. Both the story and the setting are noteworthy for a few reasons. I mentioned briefly that this game takes place in Italy, but it’s not full of picturesque vineyards or people riding on gondolas. What’s presented instead is a somewhat dystopian version of Italy set in 199X. The Holy Church is seen as a controlling authority and they are no longer respected. You can pick up on this right away if you look at the various graffiti spread throughout each location. Of the various locations that Ray visits, “Naples” is by far the strangest. 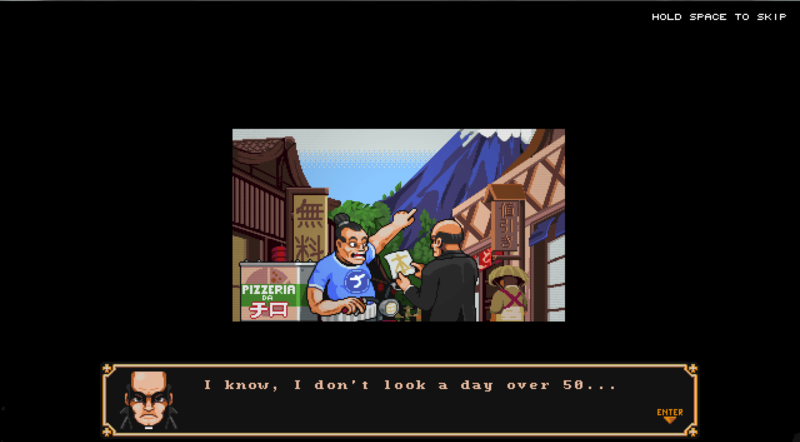 While named after a real location in Italy, the version of Naples that you visit in The Textorcist is modeled more after a rural town in Japan, complete with a scene of Ray eating pizza using a pair of chopsticks. With its eclectic set of influences, I was pretty thrilled with game’s setting. I’m a big fan of the futuristic yet nostalgic atmosphere and things that I didn’t think would pair well together actually did. My opinions of the narrative are unfortunately not as positive. While the story had a decent enough premise, I was not overly thrilled with how it was executed. From playing the demo and observing Ray’s unpleasant yet comedic attitude, I had high hopes going in. To my dismay, I found the full story to be a bit scattered and uninteresting. Ray’s secretary Magda is introduced near the onset of the game, but there isn’t a ton of banter between her and Ray despite the opportunity being there. There are a few other characters introduced throughout the game, but Ray doesn’t interact with them all that much and they aren’t given much screen time. Additionally, the story as a whole seems to be given a back seat in favor of the core gameplay: the fights. You essentially go from one fight to the next with maybe five minutes of dialogue thrown in between. Adding to that, with the main emphasis being placed on the fights themselves, there isn’t much room to convey the story. The levels themselves that exist in between the fights tend to be small and linear. An example of one of these little intermissions is a stage in which Ray searches for clues in a suspicious convent. While these cutaways are nice, they’re never expanded on in any meaningful detail. By the end of the game, it felt as though not much had actually transpired except for a string of loosely related boss fights. The story that is there isn’t bad by any means, but I would’ve appreciated more of it. I think more narrative between fights would’ve made each feel more important and helped to flesh things out a bit more. With the majority of the game’s focus being on gameplay, how does it fare? My answer to that is a bit mixed, but my thoughts are generally positive. 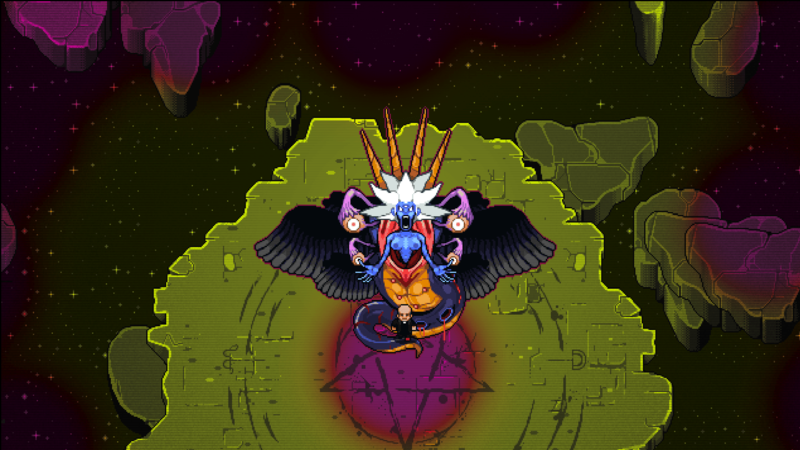 At its core, The Textorcist is a very competent bullet hell shooter. The bullet patterns in each fight are intricate and no two fights are quite the same. In addition to the normal objective of dodging these bullets, you are also tasked with typing the text that appears on-screen, generally in the form of English or Latin exorcisms. Depending on the boss, these phrases have a tendency to change on a whim as well, making each fight difficult in its own unique way. That leads into a point where my feelings start becoming less positive: the difficulty can be a bit staggering. Going in, players should expect right away that this is going to be a tough game to beat. After all, your goal is to type with both hands while also using your right hand to move around and dodge bullets. The fact that roughly 75 percent of the phrases are in Latin (sometimes upside-down or out of order) also adds to the challenge. These things make the game very challenging, but they are indeed perfect for what the developers were trying to go for. What doesn’t work as well are the penalties associated with typing a wrong letter. Rather than simply not registering the incorrect letter that you’ve typed, the game actually takes away the previous letter, making you type it again as well. This can be very problematic when you need to type things as fast as possible. Making minor mistakes while typing in English is one thing, but making them while typing in Latin is another beast entirely. I found the later levels so challenging that I legitimately started using keyboard macros to record and subsequently type the exorcisms for me. Even this proved difficult since the phrases could change on me without warning. I honestly don’t know how someone could breeze through this game without using my macro method, though some reviewers on Steam claim to have proven me wrong. Quite frankly, I rather doubt their claims. One big plus is the soundtrack. As the game proudly boasts, the music was provided by GosT, a synthwave artist who I’ve actually had the pleasure of seeing in person. His work with this soundtrack shines just as brightly as his other work. The pleasing mixture of metal guitar riffs and uptempo electronic beats lends itself well to both the fast-paced gameplay and the game’s dark atmosphere. Of course, the music played during boss fights is where most of this shines through, but even the ambient tracks that play outside of them fit quite nicely and sound pleasant. Overall, I found the sound design to be top notch. Visually speaking, I can also report that I was very impressed. The developers chose to go with a pixel art style and all of the sprites look very detailed (especially the bosses). There are a wide variety of colors utilized and (once again) the bullet patterns for each fight are all very intricate and well designed. 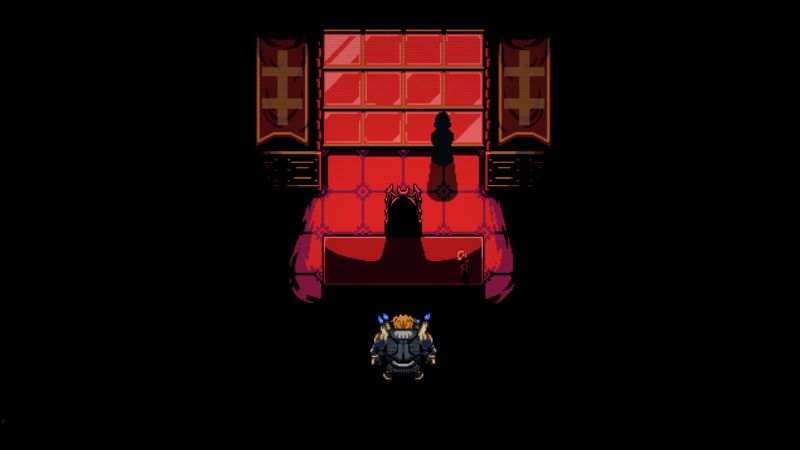 There are a handful of cutscene images thrown in as well, which remind me of something I’d see in an older DOS title. These weren’t used all that often, but I really enjoyed seeing them when they did pop up. Much like the sound design, the visuals are also deserving of an A+. 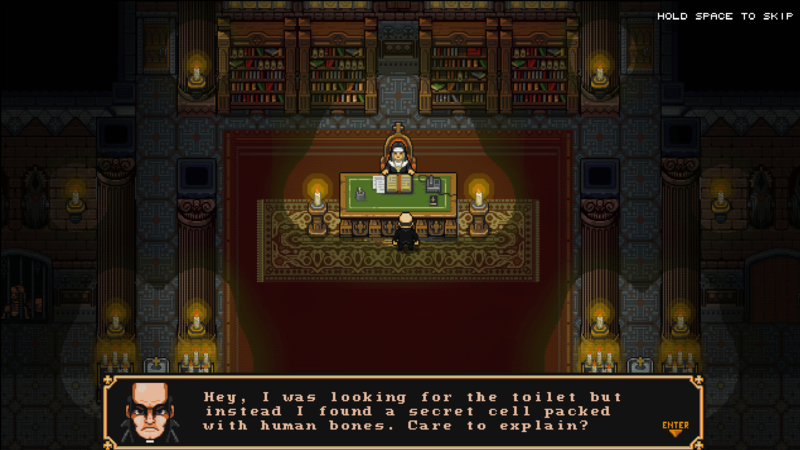 Overall, I found The Textorcist: The Story of Ray Bibbia to be a bit of a mixed bag. On one hand, the main focus of the game was on the boss fights and those were handled exceptionally well. While the difficulty will certainly seem daunting to some people (myself included), I can’t fault the game or the developers for making it hard as nails. After all, that’s really the point of such a title. On the other hand, I found the other big piece of the game, the story, to be somewhat lacking and deserving of more content. At the risk of assuming too much, I think that the boss fights were likely created first and the story was added as an afterthought. Some players may not care about this as much, but I was slightly disappointed nonetheless. Using a heavy dosage of macros to crawl through the later boss fights, I was able to clear the game in around 15 hours. I’ve seen people on Steam claiming that the game took them only a few hours to complete, but I see no way that those claims hold water. Even with macros, there are ten boss fights and all but a few require a great deal of trial and error to beat. Because the story was lacking, I can’t give this game a perfect score. What I can say though is that it’s certainly worth your consideration if you’re a masochist or just really enjoy interesting shooters. With its regular price on Steam set at just $14.99, The Textorcist is certainly worth picking up and trying for yourself.